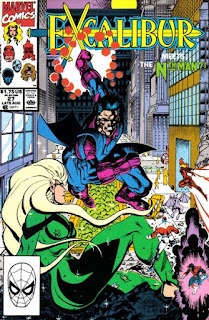 Joe and Vavara end up fighting Captain Britain and Meggan, while Nightcrawler and Phoenix tackle the supremely powerful Alfie, who is dressed like Galactus, in front of a massive TV through which Nightcrawler can see Jamie Braddock watching them. As Phoenix unleashes her full power on Alfie, Jamie tries to kill Nightcrawler to give her more motivation and make the fight more entertaining to watch. But Nightcrawler is able to hit cancel on the large TV remote control, causing everything to revert to normal, prompting Jamie to realize that he's better off creating his own realities than playing with existing ones. This issue guest stars the Nth Man, the star of short-lived sixteen issue series of the same name created by GI Joe (and upcoming Wolverine) writer Larry Hama & artist Ron Wagner, set in its own universe independent of the Marvel Universe (the world of Nth Man, like ours, views the events of the Marvel Universe as fictional tales) where World War III broke out after Alfie O'Meagan (who also appears in this issue) used his tremendous reality-altering powers to destroy the world's nuclear arsenal, upsetting the balance of power. I gather the Nth Man, aka John Doe, is basically a super-awesome ninja. I don't know for sure if Claremont was a fan of the series, but presumably he was, as the series' final issue was on sale at the same time as this one, so it's doubtful the appearance was the result of any kind of editorial mandate. I've never read it, but reading the synopsis on Wikipedia makes me intrigued. I might have to see if I can find it hiding in some quarter bins somewhere (as I doubt Marvel will ever reprint it). 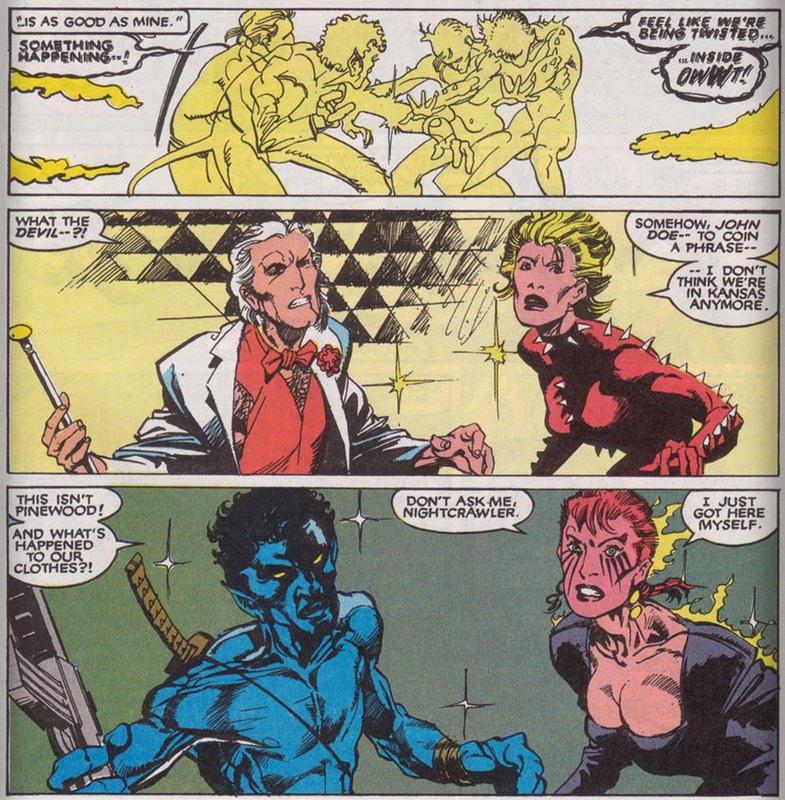 Jamie Braddock, Vixen and Nigel Frobisher, last seen in issue #21 when Jamie turned Vixen into a fox and Nigel into Vixen, appear briefly in this issue. I believe this is the final appearance of fox-Vixen, though the other two, of course, will appear again. 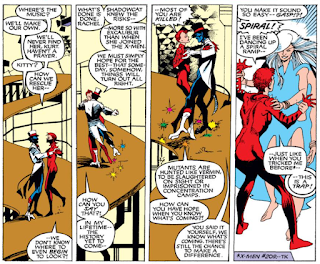 While dancing with Nightcrawler, Rachel hallucinates that he's actually Spiral, recalling Spiral's seduction of Rachel in Uncanny X-Men #209. 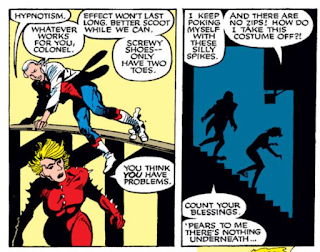 Vavara's, wearing Rachel's costume, complains about all the spikes, and notes that there's no zipper to remove it (since Rachel just manipulates it via telekinesis). Though not as polished or energetic as Alan Davis' work, the art in this issue, from Barry Windsor-Smith and Bill Sienkiewicz, is easily the highlight of it. Though the two creators' styles at this time aren't terribly complementary - Sienkiewicz's scratchy inks take something away from Windsor-Smith's smooth, lanky forms, while Windsor-Smith's more traditional pencils reign in Sienkiwiczs wild style - they nonetheless combine for a grittier, more realistic look (presumably fitting the aesthetic of Nth Man) that we've never really seen before in this series, and it's certainly the strongest non-Davis art to be featured in awhile. The same can't be said for the story, unfortunately. 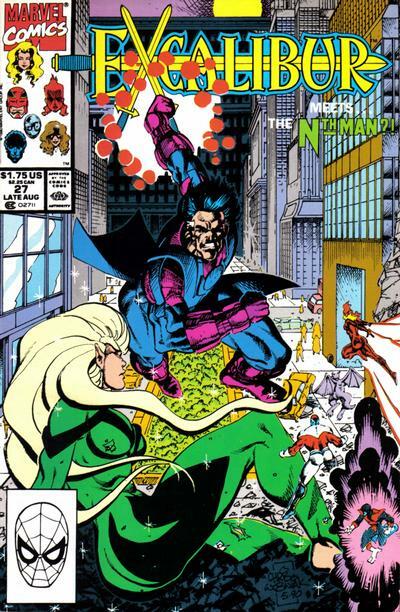 Claremont presumably had some fondness for the Nth Man, which is fine, and there's some little bits here, like the return of Jamie & Nigel and the team dealing with the loss of Shadowcat, that make the story as a whole feel less like a one-off fill-in and more a part of the ongoing narrative. 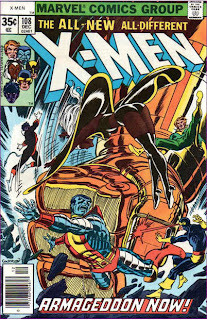 But for the most part, this reads too much like yet another chapter of the "Cross-Time Caper", with Excalibur dealing with beings from another reality and Phoenix battling some all-powerful force, a similarity Claremont himself notes in the issue itself, when Excalibur is first called in by WHO and they all groan when the alternate reality explanation for Dr. Goodstroke's presence is put forth. It's essentially too much the same, much too soon, even if the art is a step up from the usual non-Davis material. Tomorrow, the "Lazarus Project" concludes in Wolverine #30. Next week, Excalibur #28 and Wolverine #31. I have all 18 Nth Man issues. It's a very good read. The idea is that after Alfie banished all nuclear weapons, a third World War began due to the now-zero threat of nuclear annihilation. I highly recommend it. The main problem with Nth Man is that it's a Cold War story that came out just as the Eastern Bloc was crumbling. Windsor-Smith/Sienkiewicz art?!? I had no idea such a thing existed. Neat. Also neat: Jamie’s speech has no punctuation, even in the rare cases when he’s actually using complete sentences, which is an interesting way to highlight his thought process or method of expression as different without monkeying with the balloons or lettering themselves. I'm pretty sure Claremont was indeed a fan of Nth MAN, as he's said he asked for Ron Wagner to draw the upcoming "Girls' School From Heck" storyline after seeing Wagner's work on Nth. I read this issue when I read all those Captain Britain comics a few years ago. It made no sense to me. Though, while I agree with you that the style may not be aSienkiewicz match for this series, I was really impressed by the combination of Windsor-Smith and Sienkiewicz, neither of whom I like all that much separately. I didn't find this issue too sense-making on first read either. On re-read, I've come to like this one a lot. It's lack of sense is kind of a strength, I think; part of the overall sense of bedlam. "Also neat: Jamie’s speech has no punctuation, even in the rare cases when he’s actually using complete sentences, which is an interesting way to highlight his thought process or method of expression as different without monkeying with the balloons or lettering themselves." @Bedford: I have all 18 Nth Man issues. It's a very good read. Good to know. I'll have to try and track it down at the next con. @Anonymous: The main problem with Nth Man is that it's a Cold War story that came out just as the Eastern Bloc was crumbling. Yeah, reading the premise, it struck me as something that was coming a bit too late to really tap into the zeitgeist. @Blam: Windsor-Smith/Sienkiewicz art?!? I had no idea such a thing existed. Neat. Nor did I, prior to reading this issue. Nice catch. Totally missed that. @Matt: I'm pretty sure Claremont was indeed a fan of Nth MAN, as he's said he asked for Ron Wagner to draw the upcoming "Girls' School From Heck" storyline after seeing Wagner's work on Nth. Though, while I agree with you that the style may not be aSienkiewicz match for this series, I was really impressed by the combination of Windsor-Smith and Sienkiewicz, neither of whom I like all that much separately. I can easily say it's the best non-Alan Davis art on the series yet, aside from maybe the Leonardi drawn issue. I can see that. I can definitely imagine myself coming back to this one, far more than any of the other one-off fill-ins, again at some point.